Hi and welcome to our support center. Please look for an answer in our FAQ (Frequently Asked Questions) sections, before you submit a pre-sales or customer support request. Thank you. After you submit your ticket RETURN to the Contact tab, to CHECK it was submitted OK!. For How Long Can I access the Training? How Many Times can I view the videos of training? You have unlimited access; no time limit and you can view same videos as many times as you need, whenever you wish or need to learn and when you get the time to do so. Our On-Demand training is hosted online so you just need an Internet Connection and to be logged in to our site in order to access training. Do you provide one-on-one support if I have issues making clothes? Unfortunately, for this low price we cannot afford to provide 1:1 support for using MD. Our training covers all needed really; it is the equivalent of spending 10 months full-time 6 days a week learning, doing and finding solutions – all condensed into 49h power hours of training. All we already know is in here. And the fine 3D clothing we made – we teach you to do the same. 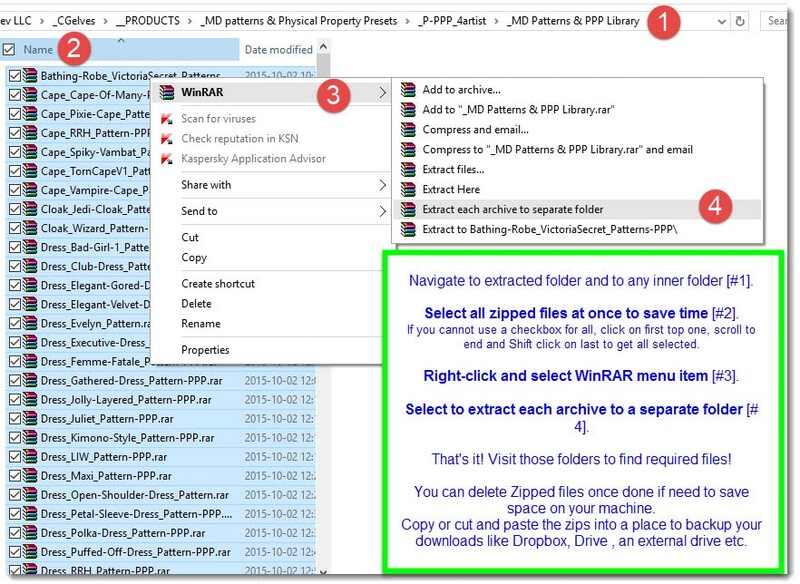 With the extra MD5 garment files or MD patterns & fabric physical property presets you have it all laid out for you. What if I can't get my Marvelous clothes looking like in your videos? We show the full, entire process of clothes making, starting from scratch. So make sure to watch the beginners course thoroughly and all workshops, to make sure you have proper training. You will then know ALL we know. If we could do it – so can you. Practice makes perfect. Camille spent over 10 months full time till late at night, 6 days a week on creating the clothes, the workshops and finding solutions. She re-made workshops and videos when she found better solutions or when CLO 3D the makers of the MD4/5 software came out with new major features. All this time is condensed into 49h only. She tried to make is as short as possible, knowing you all are busy with jobs and freelancing and need it fast. Yet, nothing important is missing or ignored. We constructed training in a logical step-by-step method, to make it as easy as possible and fast as possible for you to learn to make clothes in MD. We suggest you watch the tutorial videos / workshop videos as you make clothes. Is animation covered? What if I have issues animating clothes in MD? We cover in the lesson in the beginners course how to import an animated avatar, how to record cloth animation and the other options in the animate tab. If cloth fails to react like you want it too, you’ll need to modify the fabric physical properties to change the way cloth moves in animation (we have a lesson about physical properties). If cloth animation is too slow or exploding/crashing program – you’ll need to have stronger computer. Are you part of Marvelous Designer Clo3D? Can I post my questions to you in their forum? No. We are neither associated with nor part of CLO3D (the company making the Marvelous Designer software) and will not answer your questions in the MD forum. Submit a support ticket with correct subject/topic if you cannot find an answer first in the FAQ section. What is Difference between Artist and Enterprise Licenses? An Enterprise License is a MUST for Registered Companies, Studios, Schools and other Commercial Entities. Very small studios may be entitled for reduction – please contact us for details. For the MD training program this standard Enterprise License grants the studio 10 additional seats, so that 10 team members can be logged in simultaneously, access our site and learn MD, at any given time. Access to Training Program is unlimited during day and night for 2 years. It is very cost effective and much cheaper than hiring a teacher/trainer and paying monthly a big wage, travel costs etc. It is also more useful to be able to watch again something, on-demand. For things like our seamless textures, MD5 garment files, MD patterns & presets we provide commercial use rights to companies purchasing. An Artist License is a single user license, meaning, it is legal ONLY for the person purchasing to access our site/ use our materials for own projects and for the artist’s client projects. Where is the Training Area for "Mastering Marvelous Designer"? First, always log in. (Visit the ‘My Account‘ page – easiest way is to click the login link at very top of the site or very bottom). 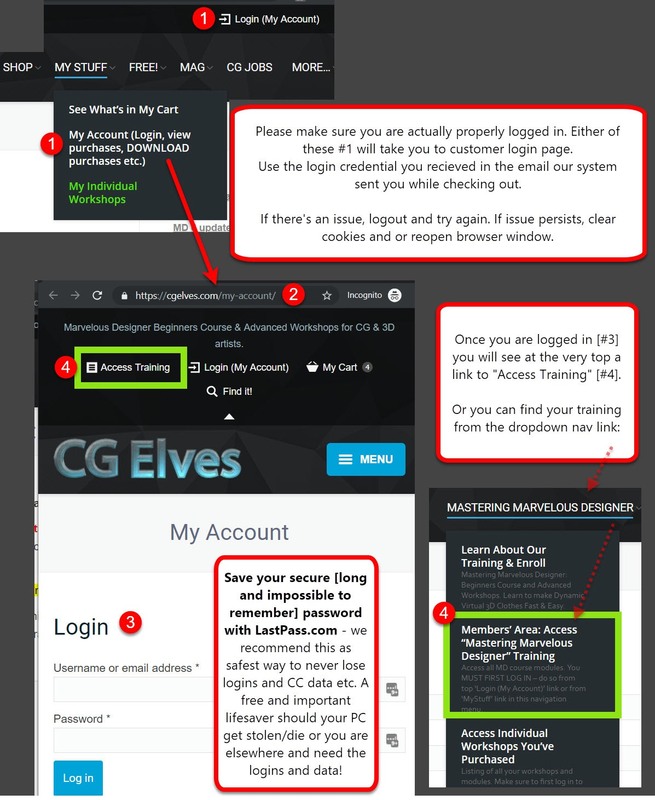 After logging in you will see a link (#3) to the MD training right near the cart and login/log out link at very top of the CG Elves website. This link will only be visible to you once you are logged in. It is a convenient link to the training’s start page. The link to it is in our site’s footer menu, at page bottom. ‘Mastering Marvelous Designer’ and then select: ‘Members Only Access’. 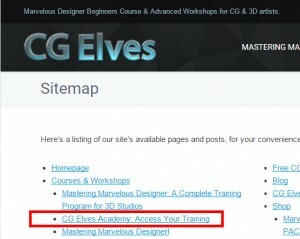 Once we have many other training materials available (in 2016), on other software and skills for CG artists, the link to ‘Mastering Marvelous Designer’ and all it’s sub/child links will be under a ‘Training’ section. I Purchased One of the MD Workshops - Where do I Find the Training? (1) Once you login to our site you will be able to access your training pages. Easiest login is at https://CGElves.com/my-account page. In the My-Account page you will see a list of your purchases. 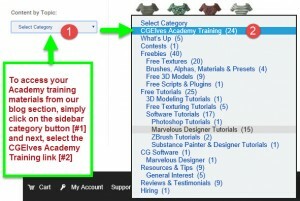 (2) Here’s the easiest way to always find all training tutorials and workshops you purchase. 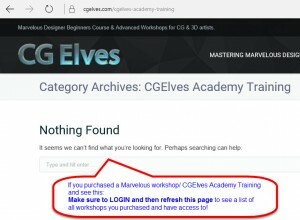 Once you are logged-in just visit: CGElves Academy Training page. Bookmark it, so you quickly can return there. (3) Scroll down to very bottom of our site- to the FOOTER MENU. Click the “Sitemap” link. Sitemap page has always the link to this page. (4) If you are visiting our blog, then you will see a category selection box on the sidebar. If you see “Nothing Found” – either you have not purchased any workshops or you need to first login. I can't access the course training pages and get redirected to the 'My Account' page! You must be logged in to be able to access the course and any product you purchase. Once logged in you will have no issues to access content! Only paying customers gain access to restricted areas, such as the MD training pages. After payment / completed purchase you have a valid account and will be able to log in and view the content you purchased. If you did not finalize purchase, then even if you received logins in our system email – your account is not yet active and you will not gain access to the training materials and members’ content pages. We are not a forum site. Please do not ask us for logins or to change them – Unless you have a VALID Purhase ID and PayPal purchase confirmation number and put this information in the support email. From a mobile device I cannot find the CGElves.com website navigation! See the icon of what looks like a few lines one over the other, like a stack of small lines? Click on it and you will see the menu! 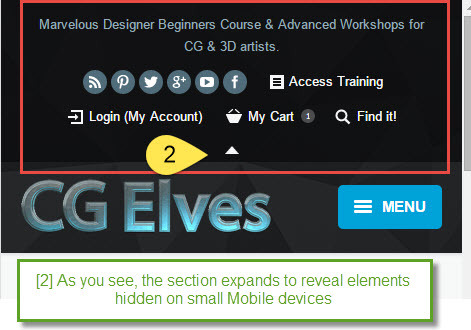 The CGElves.com site’s footer navigation will open up when you click the links /the stack icon. At our site’s header area, at very top, where on a laptop or desktop or large tablet you can see the top bar with it social icons, mini-cart and login links, however on a mobile device you will see a small white arrow in center. Click on it and it will expand to reveal the missing things! Are the Mega pack add-ons required for the MD training videos? They are of great value to you, especially patterns and the fabric physical property presets or all the clothes we teach you to make in the Clo 3D Marvelous Designer software. They will save you a LOT of time, help you quickly and easily make clothing items. You can refer to/ use patterns when you need to make sleeves, shirts, pants, dresses, jackets, capes, hoods etc. In the training we teach you all you need to know how to make clothes in MD and the advanced workshops take you by the hand through making simple to complex clothing. However, nothing like having our patterns and physical property presets for saving a LOT of time every time you need to do some garment. Do I NEED to purchase the add-on MEGA PACKS? It is completely up to you if you wish to take these one-time offers. They are tremendously reduced at great saving to you, right now. We will offer them until Christmas. After that, in 2016, you can purchase in our shop individual items and regular packs for the full price. Does the Patterns and Physical Property Presets Mega pack include Textures or Surface Textures? Our Marvelous Patterns & Physical Property Presets are intended to help you MAKE CLOTHES. We don’t include Surface Textures (color, hue, specular options etc). How you render your Marvelous 3D clothing is another matter and up to you. Most people find it better to export clothes from MD to render elsewhere and set up all the material options in another render engine. Clothes in MD do not look very real. You may buy our textures or use your own. When you bring in a texture into MD or render engine, you can then change the color, scale, add specular colors etc., to achieve the look you want. Gladly. We are always happy for feedback – submit it via the contact form. Having an issue to Login? Read this section before submitting a support ticket. I Can't REGISTER Before Purchasing and can't Login, why?! You CANNOT register before purchasing. As soon as you purchased, our system will automatically create you an account with a very secure password and email it to you. The courses and training as well as products we sell are only available for customers purchasing them. You will be able to login and access your products ONLY AFTER a confirmed purchased. You may have entered by mistake a wrong email. Or made a small mistake in entering your email. Email may for some reason be in your spam folder instead of Inbox. Check it out and make sure to white-list our emails so you never again miss receiving important emails, updates and information. If you find nothing in your Inbox folder and in Spam folder or in any other folder you may have, then contact our support team and make sure to input a valid purchase ID number – at least from PayPal if you do not have any emails from our site. Please see at very top of the site there’s a link with the text ‘Login’. Or at our site’s footer area. 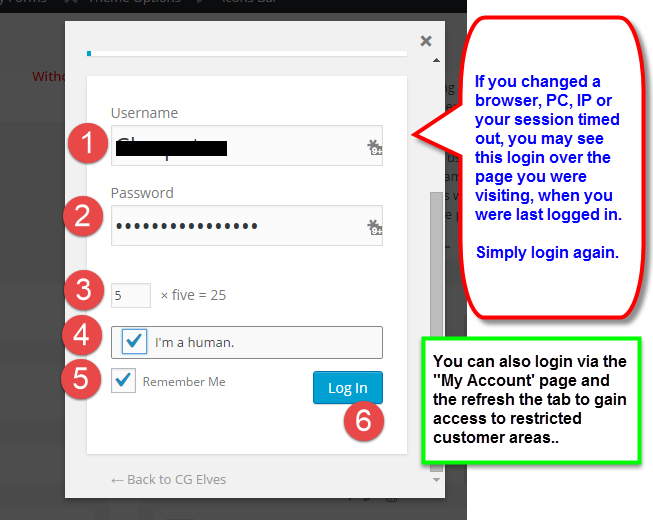 You can log in from the My-Account page. See also view on a mobile devices – the top navigation collapses and you need to click the little white arrow to open it up first, as it is already in this image. Click on the “Login (My Account)” link to login. So now when you go to the MD training pages or (from clicking the link) the start page you will have access to content! Where IS my Mastering Marvelous Designer training area?! If you can’t login, please try logging out and in again. If issues persist, refresh your browser session and or delete cookies and try logging in again. See the image (click to view full sized) for full information. Only after payment / completed purchase can you have a valid account and be able to log in! Please do not ask us for logins or to change them unless you have a VALID purhased ID and PayPal purchase confirmation number and put this information in the support email. I don't now my Purchase ID number - I got NO Emails from you confirming purchase etc. If you find nothing in your Inbox folder and have checked in Spam folder or in any other folder you may have and also see no emails there, you probably made a small misspelling or used wrong email when you filled in the checkout page information. Our shop system will email you to the email you provided at checkout page. So if that was wrong- we send emails to some address that either does not exist or belongs to other person. Contact our support team as soon as possible and make sure to input a valid purchase ID number – at least from PayPal, if you do not have any emails from our site. We will do what we can to fix the situation – so make sure to let us know your CORRECT EMAIL when you contact us. Blame it on our security system and firewall. You can be logged in only from a single computer and browser, per session. 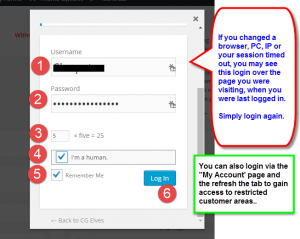 If you return to a page, after some time of inactivity, you’ll need to login again. So, just open up a new tab and go to ‘My Account’ page to login, or if system gives you the option to do so via a pop over the page you were- that also works. Why Can't I Be Logged in from 2 Computers/devices at Same Time? You cannot be logged in from 2 devices and/or browsers at same time. If you log in simultaneously/ again from another device or different browser, the former one would have you logged out. This does NOT hinder you logging in from a new device/browser. It’s part of our site security, BruteForce and hack-protection system. If you have issues try clearing session cookies in your browser and refreshing/reloading the page. I see error! It says "PAGE NOT FOUND". Did you remove the training materials? Our site firewall security system just logged you out, that’s all. We did NOT remove the training pages. So if you see a 404 not fount page error message instead of the page you were viewing videos tutorials previously – easiest solution is to open another browser tab, login and return here to reload/ refresh the page! Issues to Process Your Payment? PayPal giving me trouble to pay. Won't accept my cards. We do not and cannot control PayPal’s acceptance policy of your cards. Maybe you have not inputted correct data or have no funding on the cards. You need to ask PayPal about this. My PayPal Payment is Under Review. Can you help? Can you give me access meanwhile? We do not and cannot control PayPal’s acceptance policy of your cards and payments. In most cases such a review clears in a few minutes or a day. Also on weekend days they are fast about this. Sorry, we cannot grant access to products until your payment clears and we actually get it. You’ll need an approved Skrill account and after you fund it, you can email us the due amount in USD. We do not accept other currencies. If your order total is over $150 and you have an active Skrill account select this option in Checkout, if you cannot use PayPal. Note: We need to manually process things if you don’t use PayPal, so it will take a day or 2-3 days (depending on how busy our support is) to setup your account, once payment is confirmed and received. Where do I find my purchase history information and where can I update my contacts? Visit the ‘My Account‘ page. Login and then you find links here to view past purchases, notes and important info regarding your purchases. Click on an order link to view all its relevant download links (if you purchased something that includes downloads). You can also download a PDF invoice. If you paid via PayPal or 2Checkout you can of course get an invoice from there. You can also update your contact info. Where do I find my purchased DOWNLOADS? You should have received an email from our shop right after purchase was confirmed. It had all download links for the products you are entitled to download. Check your Inbox, and if not there then check your other folders and the spam folder (some ISPs/Email services don’t like many links in emails and see it as spam) and make sure to whitelist our emails! Visit the ‘My Account‘ page. Here you can always find things you purchased. Login and then you’ll find links here to view your past purchases and your downloads. Downloadable products have a max 14 days period for you to download them. Make sure to save the files to a few locations for safekeeping. Training videos and courses are not downloadable. You need to login and navigate to the training pages to view them. You can visit our sitemap page to easily find pages. Why do I see "You Have 10" Downloads - but they are all the same?! You can download any downloadable file that comes with the purchased product up to 10 times within 14 days of purchase date. 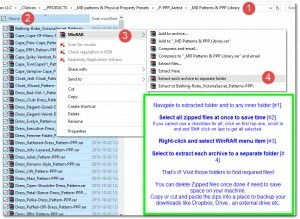 No need to download each and every file 10 times! Once is quite enough and then copy files to other locations for safe-keeping. We recommend free Dropbox account, Google drive and similar, alongside a copy on an external drive to make sure should disaster strike or computer get stolen, that you have backups. We give ability to download each file 10 times, should the internet connection die while you are in process of the download, or some other reason that download got corrupted, or you can’t remember where you saved file to and don’t know how to find it, or cannot transfer via external drive to another computer and for some reason you don’t want to use file storage services like Dropbox, Google drive etc., then you have ample downloads per file. If something happens later on and you lost all files – contact us and our friendly Elvish support will assist you, no worries. 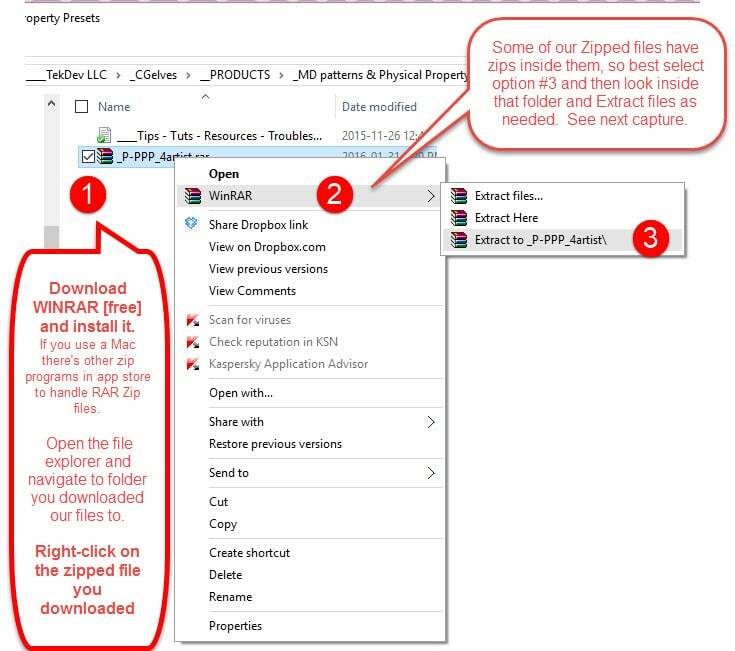 Download files are zipped with WinRAR - How to Unzip? We zip with RAR as it compresses file size better, which makes it faster to download large files. If you have a Windows machine (PC/ laptop) download the WinRAR here. If you have a Mac OS machine download the RAR extractor here from app shop. Both are free and easy to use. I need Invoices / order receipts! You can download a PDF invoice/receipt from your “My-Account” page once you are logged in. You’ll see purchase history and next to each order there’s an icon to click to download the PDF. If you paid via PayPal or 2Checkout you can of course get an invoice from their service or print out/ make a PDF from the purchase detail email they send you. I Love Your Products – Can I Earn while Promoting them? Who Can Apply to Become a CGElves Affiliate? Our Affiliate Program is open to select partners we usually invite to join. However, you can apply if have a social following, a website with lots of traffic/visitors and or an email list in relevant niche to us. Additionally, if you have not the above but wish to actively promote our products to companies, studios etc., on a commission basis, then we may gladly accept you to our program. You are prohibited to purchase for yourself with your Affiliate link in order to reduce the cost of a purchase. If you are an existing customer and are accepted as our affiliate, a separate account will be created for you as Affiliate one. How Much Can a CGElves Affiliate Earn? Our Affiliates or Brand Ambassadors earn 20-30% of sales they generate. The more you sell the higher you’ll earn in commission %. The more you promote and the more referrals you bring us who purchase, the more you’ll earn. We have no minimum payout. We pay on a Net+15 basis. Example: for sales in January you get paid February 15th, either on the 15th or within 5 business days. Is an Affiliate same as Ambassador? Typically it is just what a business decides to call their referral program. Ambassadors sound cool and sophisticated thing to be… And is what you are when you promote a BRAND, with or without a commission. Some refer to an Affiliate program as a Partner program, like in Germany. Principal is the same – you promote and get rewarded for any sale you bring us. Nothing you need to buy upfront or invest in, apart from your time to promote the products. An Affiliate is, generally speaking, someone affiliated with a business, who places promotional banners, links and or coupons online and earns from sales these generate for that business. An Ambassador is (how we see it) someone promoting our Brand name and or products wherever they can; online, offline (in some event/trade fair/etc., you go to), by cold calling, during a media interview and so forth. Can I sell Garments and Patterns I buy from you? 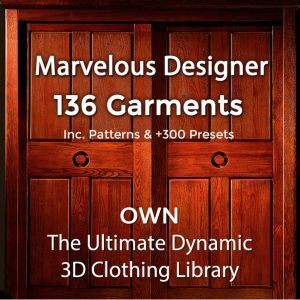 So, you purchase our Marvelous Designer Garment Files or patterns and wish to create clothing for DAZ3D / POSER users/ marketplace, Renderosity, SecondLife etc., as example. Q: What is our policy on this? A: As long as you are not selling the actual Marvelous Designer garments or patterns we sold you – you are OK with our Terms of Service. If you are selling frozen OBJ’s and/or morphs of our garments for DAZ/Poser or other similar users, you are OK as far as we’re concerned. So long as you make a pose, a morph and sell that, not our dynamic MD file itself or our patterns. If you use our files and patterns as a base to start from and alter our original materials to be significantly different then this is also OK.
To your success and good income! Let us know how we helped you in your career and income by submitting a testimonial via contact form! 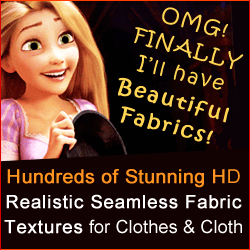 Can I sell Garments with Seamless Fabric Textures I buy from you? Distributing/selling the original seamless texture with any clothing you create is out of the question, but if it was baked into the clothing UV then all is fine with us. Distributing or selling a garment that is dynamic and has our texture/s is forbidden, as buyer can take that texture file and use it for other things. Distributing or selling a garment that is for a frozen pose (as conforming item you rigged, say for DAZ or Poser models) but with it you sell or give extra textures which are not baked into the garment is forbidden. What if I Want to Sell to Other Sellers? If you create clothing for sale to other sellers and not to end users themselves, like for example in the SecondLife virtual world where you sell to shop owners, you need to purchase the Enterprise License for the MD5 garment files or patterns and presets and/or the seamless fabric textures. It is absolutely forbidden to give and or sell our files as-is; meaning, in no way can you sell or provide our files and materials to others to give and or sell to their end-users, even if the people or businesses you gave and or sold our files to made frozen OBJ’s and baked our seamless fabric textures into them. If you purchase the enterprise license Mega Pack for MD5 garment files or MD Patterns & Presets and then you make clothes to resell to other sellers as a template for their textures/decor etc., as long as you don’t resell files you buy from us (including seamless texture packs or single textures) this is OK as far as we are concerned and may you prosper. 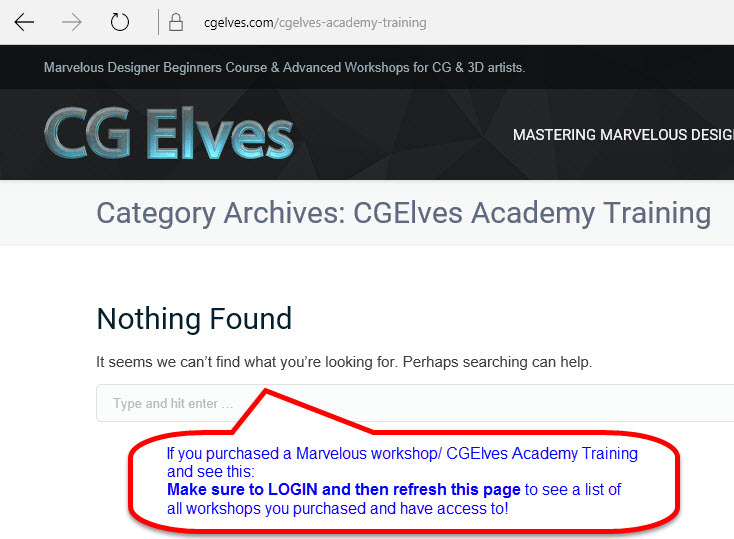 As long as you create a derivative from our products it is OK.
Do I need to Join CG Elves Newsletter? 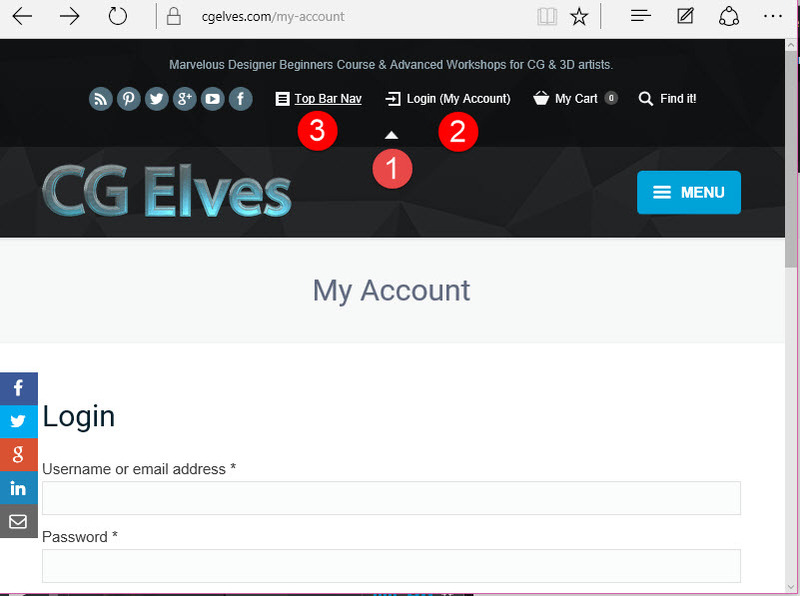 Our newsletter is an option if you wish to be notified of any special offers, coupons sales, giveaways freebies, contests, new products, other courses and about other news related to CG Elves site products and content. You can opt out at any point in time. It is easy to do so – there’s an unsubscribe link at the footer (bottom) of every email we send to subscribers. Do I stop getting customer information if I unsubscribe from the newsletter? No. We maintain separate list for notifying our customers of updates and/or changes to products they purchsed and our website important updates. If you no longer wish to get our newsletter, freebies etc – no problem. Have a Product or Tutorial You’d Like to SELL on CGElves? I have Something for Sale. How can I become your Vendor? If you, as an Artist, have training videos/ workshops/ other products for sale and wish to be one of our Vendors – contact us (via form in the right most tab). If we like your stuff and quality is high, we’ll give you a link to join as a vendor! How is CGElves DIFFERENT than other Marketplaces? We are not like any other marketplaces where you put up your products and hope to be discovered and get your stuff purchased. We ACTIVELY Promote Your products. We’re an Artist’s Marketing and Promotions Service. Perfect if you have no customer list and no huge social media following (i.e., let’s call it a “List”). Even if you do have a list, you can become a CGElves Affiliate and earn 20-30% EXTRA when you send your list to buy your (or any other) product on our website. Priority Marketing will be given to Vendors who exclusively sell a product by us. What do I Earn as a CGElves Vendor? If sale was thanks to the effort of one of our affiliates/ partners, then their commission is deducted (20-30% – of amount after coupon was deducted, if a coupon was applied during checkout). A Vendor’s product costs $39 in our shop. There’s a coupon for $10 off, so Net is $29. This is what customer pays CGElves. There was an affiliate involved (who probably gave the coupon to his referral), so affiliate gets 20% of $29 which is equal to $5.80. Net is $29 – $5.80 = $23.20 and Vendor gets 50% of this, which is $11.60. Vendor is Not charged for any payment gateway fees, taxes and other costs CGElves pays. Affiliates are CGElves partners who advertise the product to their visitors and list in return for a share of the sales generated. This helps us reach more people without upfront risk, as is the case when purchasing and paying for advertising. Purchasing ads is also something we do to promote your product – within financial viability boundaries to us; ads can be extremely costly to buy and manage, in some cases (and depending on product) cost more than what we can earn. How Can I Earn MORE as a CGElves Vendor? Vendors earn 50% of Net sales. However, you can also elect to become a CGElves Affiliate in order to earn 20-30% EXTRA when you send people to buy your (or any other) product on our website. You can promote your products with an affiliate link and special affiliate coupon we’ll give you. When your referrals purchase anything then you get a share of that sale, i.e., a Commission. Commissions start at 20% and increase the more you earn, up to 30%. This enables you as a Vendor to earn more and not only from telling people about your products, but also by promoting other people’s products and the CGElves products. This practice is great for cross-promotions of complimentary items. Whether you put a signature with your affiliate link when you do forum activity or if you have a list (lots of Facebook page likes, Twitter followers, an email list of former customers etc.). When Will I Get Paid from Sales of My Products? Payout is Net+15 via PayPal and is free. Example: Sales from January are paid out Feb 15th, within up to 5 workdays. We may offer on a per-case basis payment by Wire, or Payoneer may be available, but we cannot promise. These alternative option/s are paid out on a Net+30 if you need them. Wire payments cost $60 each, so this will be deducted from your payout. You can be paid less frequently to avoid too many costs, if Wire is the best method for you. Please enter your inquiry details in the form below after selecting the correct topic of your inquiry. If you are a customer seeking support make sure to let us know the purchase ID number. We’ll get back to you with a reply as soon as possible. Response time is usually 24-48 hours during work days. Our time zone is EST. Enter the CGElves PID number of the purchase you made on our site, as well as the PayPal PID to recieve customer support on all issues of login, password reset or other purchase related matters. Only valid submissions will be addressed. Please visit our JOBS page to see available openings and to submit your job application. NOT HERE VIA CONTACT FORM! If you really don't have the money to purchase our MD course but DO HAVE LOTS OF PROVEN TALENT doing cool 3D modeling or other capability, we may accept a swap of our course in return for some things you do, if their quality is professional. Show us some samples of your original work by providing links to it in the fields below. Tell us what you're real good at. We spent over 10 months FULL TIME learning MD in and out and preparing this course. You probably will need to spend some days doing some stuff, which we can then give away to others and/or sell on our site/s as we please and without further compensation to you, aside from the free access to the course and to the bonus materials. If this is not acceptable to you, then please don't bother sending in a barter request! Thank you for wishing to gift others! This is very noble of you. We are honored and glad to recieve this freebie from you, and - if we deem it suitable - to provide it to our members, visitors and users of our site. You have the option to permit us to also monetize and sell your freebie (See the fields below to make your selection) - this can be helpful; for example to help us gain more subscribers, so if they are not subscribed it would cost but would be free if they are subscribed. You have the option to choose if you wish us to attribute the freebie to you or to maintain your anonymity. Please read the following terms and conditions. By submitting your freebie you confirm you have read, understood and agree to these. You must be the sole creator and intellectual property rights holder to the freebie you are submitting via our online form. Enable our website visitors to view and/or download and use it without restrictions or forced credits or any form of compensation to you in any manner, now or in future. Promote, mention and/or write about your freebie on our website, other online properties and websites and permit us to use it for or in our advertising, marketing, Press Releases and/or via any other promotional channel we may use. We are not obliged in any manner to mention your name, nickname, username or other identity in our online promotions. You hereby agree by uploading and submitting your freebie, to permit us, our members, our readers, our website users and visitors unrestricted, indefinite use of your submitted freebie without compensation to you now or in future. You forfeit all financial and any other compensation claims regarding your freebie and its use as well as claims and any rights on it and its use. Please let us know if you'd like to be attributed on our site for your freebie. If you wish us to attribute you we will do so on same page where we provide your freebie to the world. Yes, I'd like you to attribute me! NOTE: We will only mention your First Name + Surname Initial + Country (Ex: John D., USA) if you do not permit us to mention full name or other info. Please let us know how we may use your freebie. (1) Please take a pic of your VALID ID - it can be of driving license ID or any other Government issued ID. You can scan it, or use your smartphone camera or any other camera, as long as result is clear to read. We need to know for legal reasons who is the person providing this freebie. (2) Upload the picture to some online storage system like dropbox, Google Drive etc and enter this link in the box below! (3) If you have special instructions or advice regarding your freebie - please let us know and mention these in the message box further below! Enter the link/s to your ID picture. Thank you! Please use the message field below to tell us what you wish to sell on CG Elves and also about yourself, your work experience and specialities. Enter one or more links to your online portfolios/ images or other samples of your work, or link to your product/freebie files which you uploaded to your Dropbox, Google Drive, CloudUp, WeTransfer or other similar file sharing service and provide us the link to view (and possibly to download) the file in the form field further below. Thank you! Thank you for being our customer and submitting your review/ testimonial! The questions below are meant as a GUIDE to help you provide a valuable testimonial with enough info, so that at our discretion, we may publish a full page for you on our site, aside from using your review. TIP: Please avoid extremely short answers or 'Yes/ No' kind of answers. Be as detailed as you can, and remember that we only use what YOU WRITE and do not include our questions when quoting your review/testimonial. If you wish us to mention your current and past work places or if you have your own studio, then provide as much or little info here as you wish. You can mention agency names and your position in each. If you're a freelancer than just mention what you do. Were you featured anywhere online? Were you published in a mag or elsewhere? Have you won any awards? Have you worked on a special movie/ game or other project you are proud of? What did you do there? How does it fit and help you in your workflow? Does it save you time? Why do you use it? Prior to purchasing our course, had you ever used or tried to use Marvelous Designer? What issues did you face? Can you understand the training even if your English is not perfect or native level? How Soon After Beginning the Training Could You Create a Clothing Item? Was it difficult for you to find patterns online? Is it difficult for you to make clothes without patterns? How fast/ easy is it to make clothes from our patterns? Please let others know just how this product helps you, adds value, what you like best about it and why they should also get it. OPTIONAL, if you wish to promote yourself/ brand. Enter here links to your social, portfolio, website, ArtStation etc. You can click the " + " to add more lines for links. ONE LINK PER LINE please! Enter one or more links to your artwork images or other samples of your work, which you created after learning our course and/or with our products. You may give us links to your images on ArtStation, Dropbox, Google Drive, CloudUp, WeTransfer, Flickr or other similar file storage service. Enter one or more links to any of your best artwork images or other samples of your work, which you would like to see us publish on our site. We may publish such image/s in a page about you or alongside your testimonial. By submitting your testimonial / review you permit us to use it in full and/or in part on our website, web properties and for our online and offline marketing, promotions and Press Releases. You hereby permit us to publish any images you mention above, your logo and content you write in this submission. (You can instruct us whether we can mention your full name and company name in the fields below).